Showing that video surveillance is in use can be a powerful crime deterrent as criminals seek out environments where their illegal activity cannot be observed. A common method of doing this is with Public View Monitors. These monitors show the public what security cameras see. In this note, we examine these devices, where they are commonly deployed, and how effective their use is considered. Monitors displays a feed from a DVR/NVR/VMS. These displays are commonly commercial off-the-shelf LCD displays that are hung from ceiling or wall mounts and connected to head end servers via component connections or HDMI adapters. Monitors that include an integrated camera, displaying the local field of view immediately in front of the monitor. These type of monitors often include an output that can be connected to a DVR or NVR for recording. The views on these displays are generally fixed to display only the integrated camera. Setting up a monitor with an integrated camera is easy. The video displayed is a local output from the connected camera. These units can then be directly connected to a DVR or via encoder to an VMS. Video from these units are then recorded just like any other analog camera. The other major type is connecting the 'head end' DVR/NVR via a local video output jack to the public view monitor. The video connection formats are not always standard among displays and head end units. For example, if an (analog) 12 or 15 pin VGA output is available on the head end, then attention must be paid to ensure the display has the appropriate inputs. Increasingly, DVI or HDMI (digital) inputs are supported by flat panel displays, and external adapters may be required to make proper connections. Care should be taken to plan cabling runs with exotic AV formats. VGA or HDMI terminated cables can be purchased in 50 foot (and longer) lengths, but these type of cables are not field terminated. Pulling these factory terminated cables could be difficult in the field. Other options for running these cables include UTP converters or specialty connector packaged cabling. We covered this subject in our update titled "Extending Surveillance Monitor Signal / Cable Runs". If the recorder does not support outputs to local displays or if the physical distance is too great to connect monitors via AV cabling, then a dedicated workstation may be required. This situation is especially common when leveraging IP solutions hosted on server hardware not designed to support local video outputs. In this case, connecting a low-end workstation to the network and running the monitor from that computer may be necessary. This is a costly approach were analog components and systems have a market price advantage. 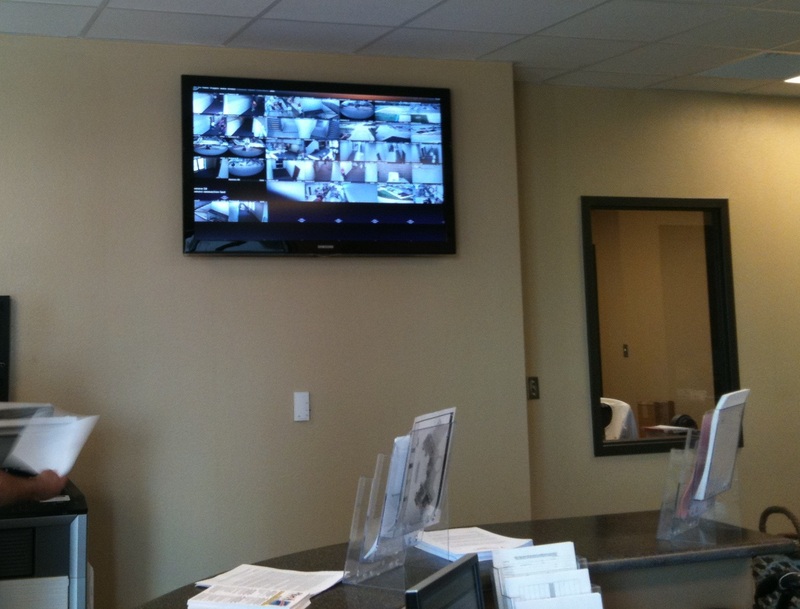 'General' public view monitors are hung in a central area like a lobby or front desk to show outward evidence to all visitors that video surveillance is in use facility wide. These monitors may have some operational benefit to show 'trouble spots' at a glance, in a fashion similar to a formal video wall. These monitors are configured to 'carousel' through preassigned views or 'pop up' views where some type of trigger has occurred, like a motion detection event or door contact break. 'Hotspot' monitors show one specific view. This primarily is used as a method to deter shoplifting or pilferage in the local area. One specific camera view is displayed to all people within the area. This type of monitor is favored in retail to make it plainly obvious the area, or customers, are being watched. 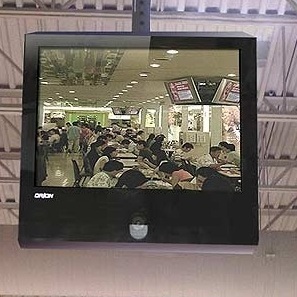 Beyond deployment in main entry areas, like the image above depicts, retail operators will sometimes deploy these monitors in 'high value' areas. These areas might be pharmacy departments, electronic displays, liquor shelves, or any other floor space where expensive, easy to shoplift items are located. The justification for this deployment is that an activity like shoplifting stands a much greater chance of being seen via Public View Monitors and is thereby discouraged from taking place. Public View Monitors prove to be a common equipment deterrent to crime. The use of Public View Monitors qualify as a CPTED strategy. Observing CPTED places great value on the use of landscaping, lighting, signage, monitoring, fencing, and architecture to influence offender decisions. In our informal LinkedIn poll, respondents overwhelmingly voted Public View Monitors as 'useful'. The common adoption of this tool in retail also indicates apparent effectiveness. 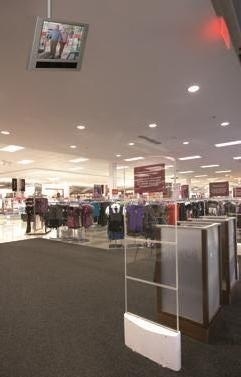 Many of the world's largest retailers have adopted Public View Monitors as part of their surveillance deployments. In some areas, regulation may govern the use of Public View Monitors. In the UK, use of public view monitoring is restricted for use in that "Viewing of live images on monitors should usually be restricted to the operator unless the monitor displays a scene which is also in plain sight from the monitor location." In the US, the 'Privacy Rule' clause in the HIPPA Act may restrict position of public view monitors depending on what information can be seen by surveillance cameras. The commonly cited 'reasonable expectation of privacy' may also prohibit deployment of these monitors near changing rooms or restrooms.